It means ‘a friend that stays by someone’s side.’ Isn’t that cool? This is the name given to me from our mother and Queen, Theiah. I used to live in a field of flowers that had plenty of warm sunshine and fragrant flowers. We love the sweet essence of flowers very very much. You call it ‘honey’ right? Sometimes its great to drink the one that makes you feel good and dizzy, but we can get into a lot of trouble from our Queen if we get caught drinking it. Still, we were able to live in bliss with the flowers and the butterflies by the grace of our benevolent Queen. Then one day, golden rifts suddenly started to appear with a flash. You cannot become an outstanding fairy if you simply pass by a mysterious sight like that. We gathered our friends and decided to leave on an adventure through the rift. However, what’s this! The place inside the rift was filled with a chaos that we’ve never seen. I got lost and after countless hours of wandering, I arrived at a place far away from home. Isn’t it? There are so many things I’ve never seen before. Some of my friends were able to get out of the rift, but they turned into petals and fell. Then an ugly thing with a huge club picked up the petal. Oh...! How dreadful! Huh? Wait! I’ve got more to tell you. I may be small, but I can do a lot of things. I can light up a dark path at night or even use certain items in your inventory. I need metals that breathed in fire then let it out... But I’m definitely useful! Hmm... So, the reason why I’m telling you this is because I’m currently trapped. I’m at the end of the rift. I don’t have a lot of strength left because I’ve wandered around for too long. If I could drink some sweet honey, I could get out of here easily. So, could you help me out when you see me? I’m sure we’ll become great friends. Just like the meaning of my name. Hello, Adventurers traveling the world of Black Desert. 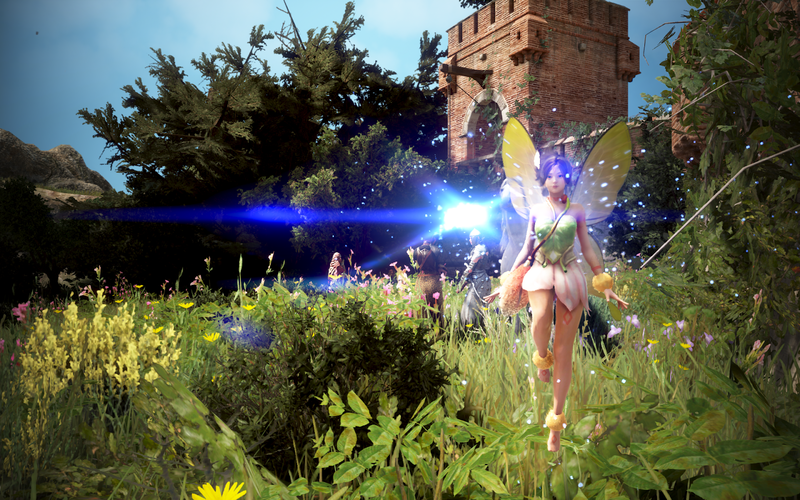 Fairy Laila has arrived in Black Desert! How do they look like? What role will they play in our long journey? This GM note introduces how you can meet them and their abilities in detail. You can get the fairy Laila using the ‘Sealed Fairy Wings’. You’ll be able to get a Sealed Fairy Wings first by completing a Black Spirit quest. Afterward, you can get them by doing the repeatable quest from Theiah in Kamasylve Temple. You complete the quest by delivering Laila's Petal that you obtain by defeating monsters, gathering, and fishing. You can meet 1 of 4 different types of Laila by using Sealed Fairy Wings. You cannot know you’ll get the Faint, Glimmering, Brilliant, or Radiant Fairy Wings until you open them. Additionally, there are fairies that learned the common language of Black Desert from their Queen! What are the Fairy’s mysterious abilities? The number of skills Laila Fairies can learn depends on its wings. There are fairies that can learn up to 5 skills and it is possible to raise or lower their skill levels. You can also level your fairies by giving them equipment weapons and armor, Black Spirit's Claw, Sweet Honey Wine, Ornette's Dark Honey Wine. Fairies will learn 1 skill for every 10 levels. All fairies that you get have the standard skill that raises your Luck +1 and is applied. Here is the list of skills a fairy can learn and their effects. There are a number of ways to set your fairies free depending on whether you like the fairy you get or not! First, try releasing your current fairy if you like the new one better! The released fairy will leave some Fairy Powder to show its appreciation. Second, exchange Fairy Wings you don’t like with Ceilyn in Kamasylvia Temple! You’ll get Sweet Honey Wine that can be used to level your fairy. Third, collect Laila's Petal if you're already happy with the fairy that you have. You can get 1 Fairy's Blessing by exchanging 10 Laila's Petal with Theiah in Kamasylvia Temple. - Fairy's Blessing has the same effect as Valk’s Cry. You’ll get Valks Enhancement Chance +1 when you use 1 Fairy's Blessing. You must have realized how useful the fairy can be as an Adventurer in Black Desert. This doesn’t mean your travels will be much harder if you don’t ever meet a fairy. It just means they can make life much easier if you had one as your friend. We hope you get the chance to meet your own fairy that’ll help you along your journey.